The logo that led some health professionals to claim Ferrari were subliminally advertising Marlboro cigarettes. (CNN) -- Ferrari President Luca di Montezemolo has dismissed claims that his team's cars carry subliminal tobacco advertising as "ridiculous." 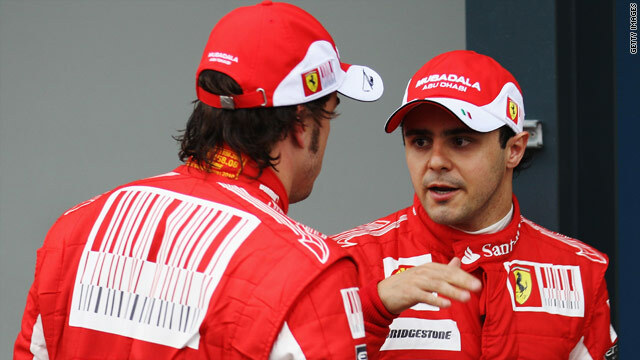 Reports last week quoted several health professionals as suggesting the red, white and black barcode on Ferrari's Formula One cars and Felipe Massa and Fernando Alonso's overalls were a link to Marlboro cigarettes. Tobacco advertising in F1 was outlawed in 2005, yet reports claimed a spokesman for the European Public Health Commissioner said the barcode constituted potential subliminal marketing. The Times newspaper quoted John Britton, a Fellow of the Royal College of Physicians, as saying the barcode resembled the lower half of a packet of Marlboro cigarettes, and that it was "creeping branding". Frankly, I find this argument completely pointless. Under a law passed in both Britain and Brussels in 2002, it is an offence for a tobacco company to sponsor a sporting event. Phillip Morris, the owner of Marlboro cigarettes, is a long-standing sponsor of Ferrari, but Montezemolo has described the stories as "pointless." He told Ferrari's official Web site: "Frankly, I find this argument completely pointless and it is verging on the ridiculous to claim that the color red or a graphic design which shows a bar code could induce people to smoke. "At a time when, on the other side of the Atlantic they are fighting to provide a more equal health service, in the old continent of Europe, so called experts are racking their brains to come up with theories that have no scientific basis: I think there are more important matters to think about than a bar code. "Therefore, it's best not to waste any more time replying to this sort of nonsense or to those who are instrumental in wanting to stoke up the story."